Thursday, May 2 2019 • 8:30 a.m. to 3:30 p.m.
Annapolis, Md., January 15, 2019 — Maryland farmers and forest landowners can now apply for assistance to protect the health and productivity of their land through federal conservation programs. USDA’s Natural Resources Conservation Service offers technical and financial assistance to plan and install conservation practices on cropland, pastureland, and non-industrial private forestland. NRCS accepts applications year-round but makes funding selections at specific times. 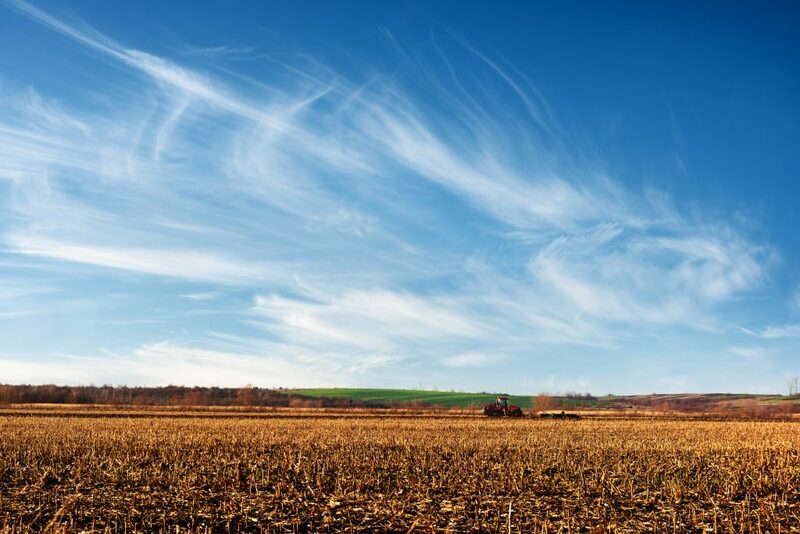 Maryland has established February 15, 2019 as the next deadline for the Environmental Quality Incentives Program (EQIP), the Agricultural Management Assistance program (AMA), and EQIP applications for Regional Conservation Partnership Program projects. EQIP provides financial and technical assistance to agricultural producers and forestland owners to address natural resource concerns and deliver environmental benefits such as improved water quality, reduced soil erosion, and improvements in soil health, wildlife habitat, plant and animal communities and energy conservation. AMA is designed help with irrigation systems and high tunnels. Maryland currently offers RCPP in select areas across the state through local projects that range in focus, from animal waste management practices, to improving soil health, to wildlife habitat restoration. During a government shutdown, agencies that receive mandatory funding or have funds appropriated in prior years that are carried forward can continue to serve customers using that money. NRCS is in this category and is open for business. A conservation plan should be completed before an application can be considered for funding, so farmers are encouraged to call or stop by their local NRCS field office as soon as possible. You can find your local office by visiting https://www.farmers.gov/service-locator or in the phone book under Federal Government, U.S. Department of Agriculture. A complete list of eligible activities is available on the NRCS Maryland website at www.md.nrcs.usda.gov. The Maryland Association of Soil Conservation Districts (MASCD) has recently been awarded funding from the Rural Maryland Council (RMC) and The Franklin P. and Arthur W. Perdue Foundation to host workshops around the state focused on bringing awareness to Mental Health in rural areas. While not often talked about in our industry, farmers have one of the highest suicide rates of any job in the U.S., according to the Center for Disease Control and Prevention. Farmers are also among the highest risk professions for drug abuse and alcoholism. Register for free online: https://www.eventbrite.com/e/mental-health-workshops-tickets-54707317058 MASCD, in partnership with University of Maryland Extension, is hoping to make a change in that trend within the state of Maryland. Through workshops being held in March, individuals working in the field with farmers on a daily basis will receive training to detect early warning signs and prevention methods for severe mental stress and substance abuse. These workshops will be targeted towards, but not limited to, agricultural lenders, agribusiness professionals, crop consultants, extension agents, farm bureau leaders, nutrient management planners, and soil conservation district employees. Farmers and farm families are also welcomed and encouraged to attend. 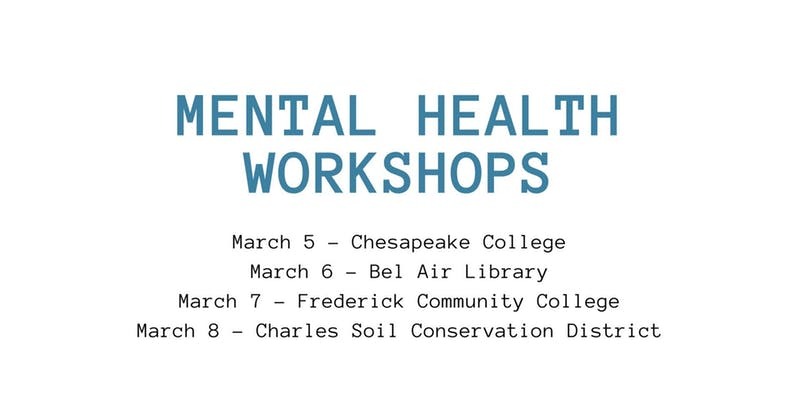 The workshops will be held at four locations around the state this coming winter; including one at Chesapeake College on March 5, Harford County Public Library in Bel Air library on March 6, Frederick Community College on March 7, and the Charles Soil Conservation District on March 8, 2019. MASCD hopes this project will benefit farm families across the state of Maryland. Stay tuned for more details as registration opens in the coming months. For more information, contact Danielle Bauer, 443-262-8491 or Danielle.mdag@gmail.com. If you or anyone you know is struggling with mental stress, please contact the National Suicide Prevention Lifeline: 1-800-273-TALK (8255).